Dec. 10, 2015 - Hampton City Council Wednesday renamed the Buckroe Fishing Pier to the James T. Wilson Fishing Pier in honor of the city's Parks and Recreation director (shown above with his wife Elizabeth and Mayor George Wallace). Wilson is retiring Jan. 1. A resolution approved by Council noted that Wilson was hired by the city as a landscape supervisor in 1971 and has dedicated 44 years to the citizens of Hampton. In 1980 he was recognized by the Exchange Club as a city employee of the year and in 1984 he was voted Credit Union Volunteer of the Year by the Hampton Roads Chapter of Credit Unions. In 1994 he received an achievement award for his efforts to identify and prioritize organizational processes in the city, and in 2003 he was recognized by the city manager as employee of the year in the supervisory category. Over the years, Wilson was involved in managing the lifeguards at Buckroe Beach, closing the Buckroe amusement park, renovating and relocating the Hampton Carousel and reopening of Pier One. After Hurricane Isabel, he lead the project to rebuilding the fishing pier. 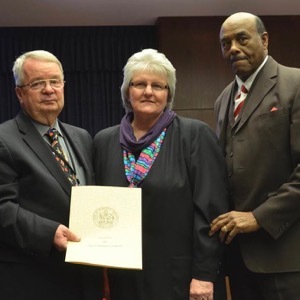 "Because of his dedication, commitment, loyalty, steadfastness and unwavering service to the citizens of the City of Hampton for more than 44 years, the City Council of the City of Hampton, Virginia believes it is fit and proper to honor James T. Wilson" the resolution reads.